US President Barack Obama and boxing great George Foreman have led worldwide tributes to Muhammad Ali, who has died at the age of 74. "Ali shook up the world - and the world is better for it," Obama said. Foreman, who was beaten by Ali in the Rumble in the Jungle in 1974, said: "Muhammad Ali made you love him." British Prime Minister David Cameron, musician Sir Paul McCartney, boxers Mike Tyson and Floyd Mayweather and golfer Tiger Woods also paid tribute. Ali was admitted to a hospital in the US city of Phoenix, Arizona on Thursday suffering from a respiratory illness, a condition that was complicated by Parkinson's disease. The three-time world champion died from septic shock caused by "unspecified natural causes", his spokesman Bob Gunnell said. Ali's funeral will take place in his home town of Louisville, Kentucky at 19:00 BST on Friday, 10 June, where flags have been flying at half-mast since his death was announced. Former US president Bill Clinton and comedian Billy Crystal will deliver eulogies at the service, which will be open to the public. A procession will also be held in Louisville on the same day. What made 'The Greatest' so great? In a lengthy statement, Obama said both he and wife Michelle "pray that the greatest fighter of them all finally rests in peace". "Like everyone else on the planet, Michelle and I mourn his passing," he said. "But we're also grateful to God for how fortunate we are to have known him, if just for a while; for how fortunate we all are that The Greatest chose to grace our time." Ali's quick wit and vocal indignation over racial discrimination made him a compelling character away from the ring. He also refused to be drafted into the Army during the Vietnam War because of his religious beliefs, resulting in him losing his licence and world title. "He stood with King and Mandela; stood up when it was hard; spoke out when others wouldn't. His fight outside the ring would cost him his title and his public standing," Obama added. "It would earn him enemies on the left and the right, make him reviled, and nearly send him to jail. But Ali stood his ground. And his victory helped us get used to the America we recognise today. "He wasn't perfect, of course. For all his magic in the ring, he could be careless with his words, and full of contradictions as his faith evolved. But his wonderful, infectious, even innocent spirit ultimately won him more fans than foes - maybe because in him, we hoped to see something of ourselves. Speaking to BBC Radio 5 live, two-time world champion Foreman said: "Muhammad Ali was what I call beautiful. He has been something special. "The man was the greatest. Forget about boxing, he was one of the greatest men to appear on television, in the media." Foreman's loss to Ali in Kinshasa, Zaire [now DR Congo] 42 years ago stands as one of the most iconic moments in any sport. Ali's 'rope-a-dope' strategy tired the unbeaten Foreman in the 80 degree heat, allowing him to force a stoppage in the eighth round. "Little did I know I would be facing something greater than a boxer," Foreman said of the fight. "He stood the test. He took everything I had and gave back worse. I loved the man. I wanted to beat him and knock him out but I loved the man." Don King, who promoted many of Ali's fights, including the Rumble in the Jungle, said: "It's a sad day for life. I loved Muhammad Ali, he was my friend. Ali will never die. "Like Martin Luther King, his spirit will live on. He stood for the world." Eight-weight world champion Manny Pacquiao described Ali as a "giant". "Boxing benefitted from Muhammad Ali's talents but not as much as mankind benefitted from his humanity," the Filipino said. Floyd Mayweather, a world champion across five divisions, added: "There will never be another Muhammad Ali. The black community all around the world, black people all around the world, needed him. He was the voice for us. He's the voice for me to be where I'm at today." Barry McGuigan, former world featherweight champion, said: "Everybody wanted to box because of him. He was just so amazing in every way. More than anything else, it was how humble and how brilliantly charismatic he was. "He was a beautiful-looking man, a beautiful-looking individual and he had so much compassion. He was the greatest sportsman there has ever been and we were very lucky that he chose boxing." 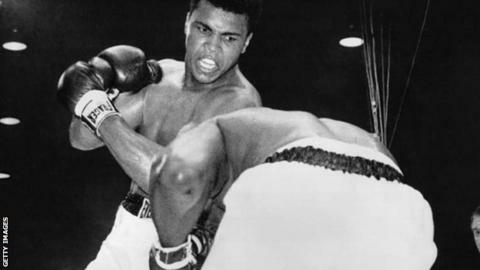 World cruiserweight champion Tony Bellew described Ali as "the ultimate hero". "It's heartbreaking news to wake up to. The greatest sportsman of all-time in my opinion. He transcended the sport and this is a sad day," he said. "I hope something can be named after him. He can never be replicated." Former world super-middleweight and light-heavyweight champion Joe Calzaghe said Ali was his "inspiration". "People loved him, he was someone completely different, he backed it up in the ring and everybody wanted to tune in and watch him fight," the Welshman said. "There'll never be another Muhammad Ali. He was a superstar." British journalist Michael Parkinson interviewed Muhammad Ali four times and remembers him as boxing's biggest ever star. "He was a rockstar," Parkinson told BBC World Service. "It was not often I was gobsmacked but as he walked across the studio floor I'd never seen a more graceful or beautiful man, he was extraordinary. "He was a man who could fell you with a blow - kill you maybe - yet he had beautiful hands with long tapering fingers." Former Beatle Sir Paul McCartney said "the world has lost a truly great man". "Dear Muhammad Ali. I loved that man. He was great from the first day we met him in Miami, and on the numerous occasions when I ran into him over the years," McCartney said in a statement. "Besides being the greatest boxer, he was a beautiful, gentle man with a great sense of humour who would often pull a pack of cards out of his pocket, no matter how posh the occasion, and do a card trick for you." British Prime Minister David Cameron said: "Muhammad Ali was not just a champion in the ring - he was a champion of civil rights, and a role model for so many people." Former US President Bill Clinton said Ali possessed "a blend of beauty and grace, speed and strength that may never be matched again". "We watched him grow from the brash self-confidence of youth and success into a manhood full of religious and political convictions that led him to make tough choices and live with the consequences," he added. "Along the way we saw him courageous in the ring, inspiring to the young, compassionate to those in need, and strong and good-humoured in bearing the burden of his own health challenges."